Traveling Show at The Red Brick Gallery - Go Foxburg! The Red Brick Gallery and Shop is an artist cooperative sponsored by the Allegheny Riverstone Center for the Arts located in Foxburg, PA, and has just reopened for its fourth season. In the summer of 2013 the Red Brick Gallery invited fellow artists from the Saxonburg Area Artist Cooperative (SAAC) for a guest exhibition of their works at the Red Brick in the Upstairs Gallery. SAAC reciprocated the invitation and the Red Brick Gallery is pleased to announce a number of the Red Brick artists will be participating in a traveling show hosted by SAAC at their gallery location in Saxonburg. The show begins Friday May 9th with an opening reception Saturday evening from 6:30 PM to 8:30 PM. The “Multi-Artist / Mixed Media Show” will feature a number of Red Brick members: accomplished photographers; Raymond Rossi and Daniel Stainer, painters; Donna Edmonds – botanical watercolors, Jason Floyd Lewis – captivating landscapes, Angela Hardwick – scenes with an old England air; the intriguing tapestry artist Rhoda Taylor and hand weaver Blanche Hall along with the prolific popular potter Paul O’Neal and sweet ceramic works of Amanda Lewis. The Red Brick artists are delighted to travel south and share the spotlight with their friends at SAAC. 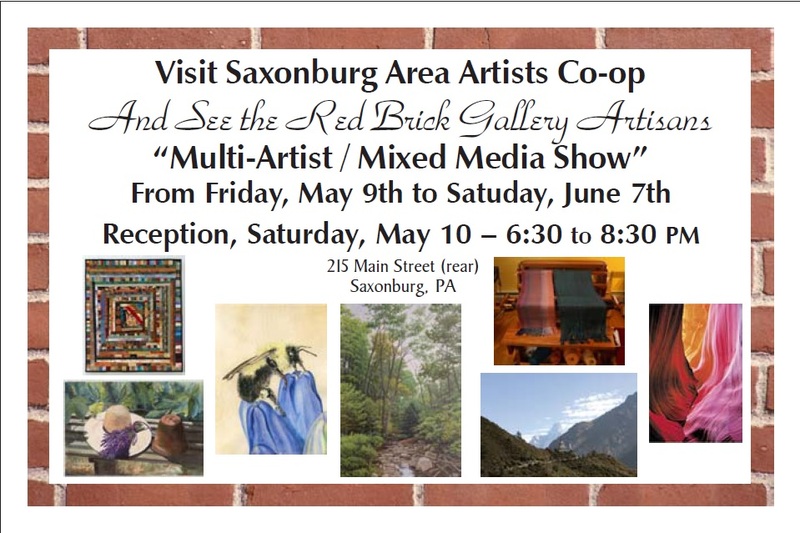 The Saxonburg Area Artists Cooperative is located in the vibrant and revitalized town core of Saxonburg at 215 Main Street (rear) and the COOP hours are Friday 12 noon to 8 PM and Saturday 10 AM to 8 PM. The SAAC gallery phone number is 412-260-5779. ARCA established the Red Brick Artist Cooperative in 2011 to provide area artists a suitable venue for the display and viewing of their works and a consignment sales outlet for the members. Artist Donna Edmonds initially helped organize and coordinate the gallery events as well as member participation, who all volunteer their time to have the space open to the public. The Gallery’s home is a charming and historic 135 year old building that was once the business office of the Fox family from Philadelphia and the namesake of the Foxburg village. It was attractively restored by its current owners who are also ARCA members since 2004, and became known as The Red Brick. The building also serves as the office of the Allegheny RiverStone Center for the Arts, a regional non profit organization fostering the performing arts in the northern Allegheny River valley and encouraging local artists efforts. For more information on the Red Brick Gallery Traveling Show feel free to contact Drew Orient at 412-867-1816 or by email odrewid@aol.com. To know more about ARCA and its mission, as well as the Red Brick Gallery and Shop visit www.alleghenyriverstone.org. Next Red Brick Upstairs Gallery Show is “Two Voices in Fiber” beginning Friday May 23rd with an Opening Reception Saturday May 24th from 3:30 PM to 5:30 PM. Current show is Fritz Keck’s “Oil Portraits of Historic Pittsburgh” now through May 18th, it is a nostalgic visit down memory lane.